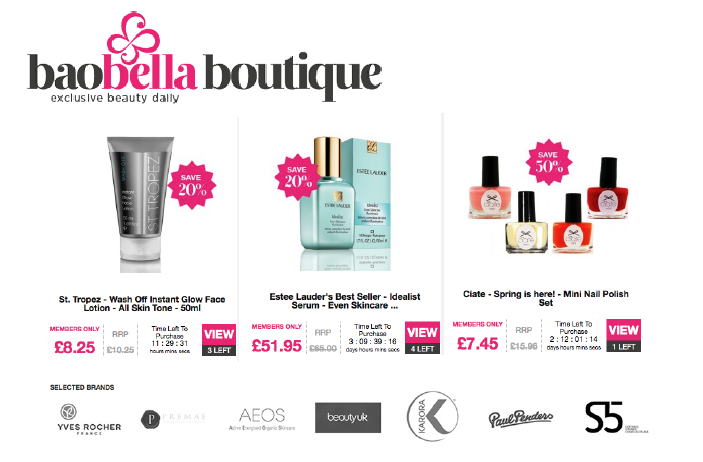 Ladies let’s be honest we all love a good bargain and if your a little like me and tend to over spend on beauty and fashion items BoaBella Boutique is an ideal place for you to find some exclusive beauty deals on some of the hottest products out there. They are an online discount store offering new deals on daily basis, where you can find products which are discounted up to 80%. Brands range from St Tropez to Estee Lauder .The great thing about this website is that its so simple to use , you join up for a free membership and get discounts and offers emailed to you. With daily deals added everyday there is a limited edition of each product which means it works on a first come first serve basis. A new deal is added at Midnight daily so you can check them out anytime after that , once it has been posted it is usually available for around 72 hours however that can vary if products get sold out before hand. They have a 100% genuine product guarantee as they assure they work closely with top brands where they are able to get the best deals.